at The Embroiderers' Guild NSW Inc. There will be special door prizes and we encourage all to bring something to share for morning or afternoon tea. Contemporary machine quilter extraordinaire Nicole Bridges presents the July showcase at the Guild Office at 10am, Friday 4 July 2008. Nicole was awarded the Down Under Quilts prize for Best Use of Colour at the Sydney Quilt Show 2008 for her quilt Touchstones #2 (left below). 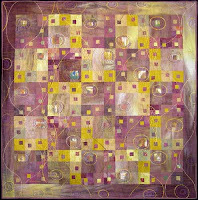 She was also awarded third prize in the Art Quilt Category for Touchstones #3. Every couple of years the Australian Quilt Study Group holds a conference. Southern Queensland Quilt Study Group was asked to host the Conference for 2008. This small group has risen to the task & is holding the conference on the weekend before the Queensland Quilters annual Quilt Show. That is - 17th - 19th October. We invite you to join us for the Conference & stay on for the 2Q Quilt Show which starts on the Wednesday after the Conference. This is a really nice time of year in Queensland - not too hot & humid. A collection of old quilts – venue to be advised. Junior Workshop - Paint n Patch Bag, 17 January 2009. Complete your workshop booking form and return it to the Guild office with your payment to reserve your place. Eyeline is an initiative of tACTile, a group of Canberra-based textile artists aiming to advance contemporary quiltmaking in Australia. The group includes Dianne Firth, Beth and Trevor Reid, Helen Grey, Jenny Bowker and Beth Miller. Celebrate the opening weekend of textile exhibition A Red World & Wangaratta’s Stitched Up Textile Festival listening to talks by some of Australia’s most respected textile artists: Beth Hatton, Dianne Firth, Ilka White & Pamela Fitzsimons with a light lunch catered by Tread & an opportunity for questions and discussion (11am - 2.30pm, Sunday 22 June - Bookings essential). The next deadline for content for the Guild newsletter is Tuesday, 8 July 2008. 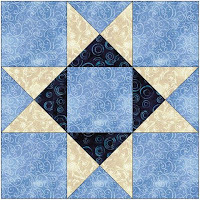 If you have details about a forthcoming quilt show, or any other quilting-related news items, that you would like to be included in the newsletter to be distributed in September 2008, please e-mail the information to the newsletter editor, Becky. Technology Wise Investments for Your Art with Lisa Chipetine www.threadplay.com. Members who are either highly skilled or in early stages of developing quilting expertise are encouraged to apply for a scholarship. The Guild’s scholarship program has provision to distribute financial support to one or more members during 2008/09. A maximum of $5,000 per annum is available to be shared between two or more successful applicants; maximum to any single applicant is $3,000. Consideration will be given to submissions from individuals or groups with continuous Guild membership of at least three (3) years. Written applications need to be sent (hard copy) to the Vice President at the Guild office address by Friday 29 August 2008. The information that must be included in any application is substantially the same as for 2008. See this blog post or download this flyer for more information. Quilting in Cyberspace in the June2008 issue of The Template looks at sites for children's quilts and the festive times of year. Why not get a head start on some of your Christmas projects in July? (Note: the internet is an ever-changing medium: we've done our best to provide and check these links, but do be aware that sites can change/vanish overnight). 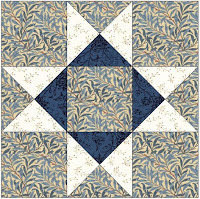 The second block of the quarter for 2008 is a traditional Ohio star block using blue and cream fabrics. All the instructions for this 12 1/2in block are in the current issue of The Template newsletter but here are some colour images for a guide. Please note that the Block of the Quarter will be drawn at the Burwood meeting in on Saturday 16 August. You can participate in the Block of the Quarter by bringing your TWO blocks along to the meeting or posting them into the Guild office by no later than Tuesday, 12 August 2008. Congratulations to Adriana Gismondi and Vicki Jenkin. 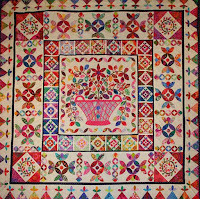 Their quilts, A Quilters' Encyclopedia - Australian Parrots and Rose Rhapsody, were voted first and second prize in the Viewers' Choice awards at the Sydney Quilt Show 2008. Kidskills activities and quilting demonstrations. Don't miss out! and don't forget to buy a raffle ticket too. Share the link with all your friends and congratulations to the prize winners including Merelyn Pearce who was awarded Best of Show for her quilt Wheelflower Medallion, another applique masterpiece inspired by the works of Margaret Preston. Today is the opening day of the Sydney Quilt Show! A gallery of the prize winning quilts will be posted online around noon so do check back later for the link. In the meantime, if you are able to attend the quilt show in person, don't forget to bring your camera. To complement the exhibition Silver: Paul de Lamerie from the Cahn Collection, the Museum is currently displaying a spectacular open robe of silver brocade from the permanent collection. Made in about 1760, the gown can tell us much about fashion in the 1700s. Hear costume Curator, Louise Mitchell tell the story of Rococo fashion with specific reference to the Museum's most spectacular gown. June 2008 Template - Out now! a sneak preview of some quilts from this year's Guest Exhibitor at the Sydney Quilt Show, Kim McLean. The quilt on the cover is Crysalis by Amanda Daly, first prize winner in the Guild's 25th Anniversary theme challenge, Looking Forward, Looking Back. The theme for this year's challenge is "Coast & Country" and entries close on 26 September 2008. First prize is Select 3.0 Quilting with IDT sewing machine valued at $900 + a five year warranty. See the Guild website for more details. If you weren't able to attend last Saturday's meeting at Burwood, you can find out more about the range of alternative quilt finishes (other than binding) via Brenda Smith's listing of online tutorials. 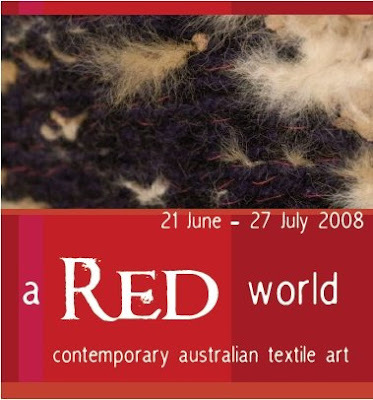 You are invited to tour the Textile Art Collection of the New South Wales Parliament with artist Diane Groenewegen on Monday, 7 July 2008. This tour takes you through the textile artwork of the NSW Parliament. Diane, your guide, will explain these artworks in terms of technique and history and reveal some of the behind-the-scenes stories associated with their creation. At the time these were commissioned she was the President of the Craft Council of NSW and is a well-known textile artist and teacher. Join us for a unique opportunity to view and learn about these important works. The program is organised by the Education Section of the NSW Parliament. Venue: Parliament House is in Macquarie Street, almost opposite Martin Place. Public transport is recommended as parking at the Parliament is not available. The nearest train stations are Martin Place and St James. Participants should enter Parliament via Macquarie Street and make their way to the Legislative Assembly reception desk. The Guild's publicity and sponsorship officer, Alan Tremain, presents the June showcase at the Guild Office at 10am, Friday 2 June 2008. Alan is an accomplished textile artist and uses a wide range of techniques. Alan's quilt Hitomi's Flower (pictured) features as the quilt for the month of April in the Guild's 25th Anniversary 2008 calendar. Calendars will be available for purchase at the Sydney Quilt Show for the reduced price of $10. New members (who have not held membership in the last three years) will also receive a free copy of the calendar while stocks last.